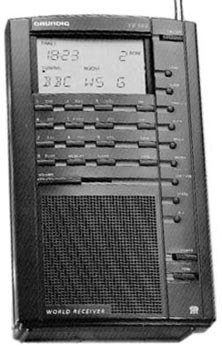 The Yacht Boy 500 is a dual coverage portable digital receiver covering 150-353, 513-30000 kHz and the FM broadcast band. FM stereo is provided to the earphone jack. Single sideband reception is supported. 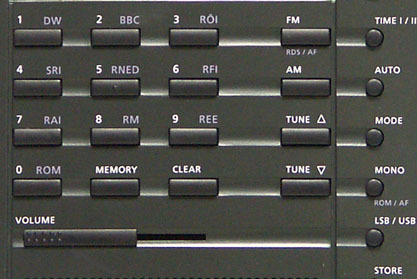 This radio features: S Indicator, Dial Lamp, Dial Lamp Switch, 40 Memories, RDS FM, 90 ROM Frequencies, Tilt Stand, Keypad, Lock, Dual 24 Hour Clocks, Up-Down Tuning, Tone Switch, Line Output and Recorder Activation. Supplied with dual voltage AC adapter or operates from four AA cells (not supplied) or 9 VDC. 4.4 x 7.5 x 1.6 inches 5 lbs. Made in Portugal. The YB-500 has been discontinued and replaced by the YB-550PE.